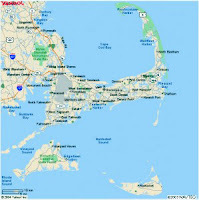 Cape Cod is known for it beautiful beaches and summer fun. Also, it is now getting to be known for its network of splendid bike trails. Many guests at our Cape Cod bed and breakfast are cyclist, ranging in skill and dedication from the causal rider needing to rent a bike locally, to the fully spandex-decked-out nut with the clamp-on shoes (not the technical term, but you know who I mean). The first type wears his baseball cape and meanders about on a sturdy set of big tired wheels from the rental shop on Jarvis street. For these guests, the short rides around Sandwich Village, or maybe as far as the Boardwalk, is often as much exercise as they want. The second type dons a Star Wars like aerodynamic helmet and lovingly unloads his very expensive, ultra light, thin tired, racing machine from his custom-made bike rack with the half dozen locks. Lance Armstrong has nothing on these guys, including the faux near florescent yellow jersey. 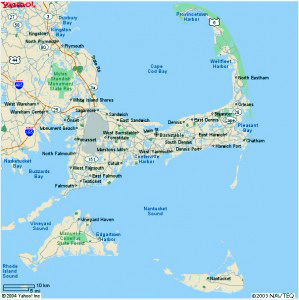 I am pleased to say that Cape Cod and the Islands have much to offer both of these riders, as well as the many different leveled enthusiasts in between. Oh, a third type is the off road mountain biker, who most likely did BMX racing as kid, has had a few extremity fractures in the past, and I bet a total hip replacement or two in their future. In appealing to the biggest part of the bell curve of cyclist and needs of my most common baby-boomer guests, I will cover the trials that are paved and more civilized, leaving the off-roaders to find their own Trial of Tears. 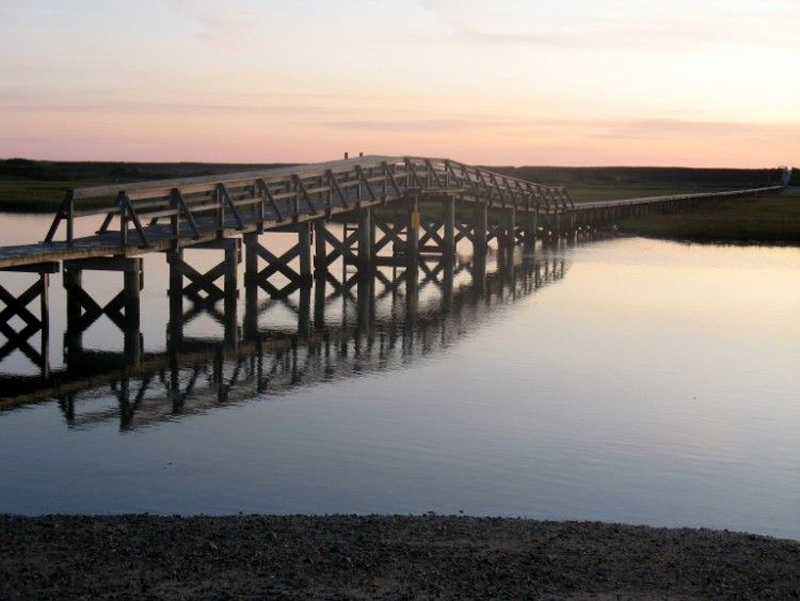 As always, we see Sandwich as a great central location for all types of Cape Cod recreation and site seeing during any season, and our Inn as the logical and convenient place to stay. We happen to be only a mile or so from the start of one of the easiest bike paths, the Cape Cod Canal Bikeway. The man-made Cape Cod Canal was built at the turn of the last century and connected two rivers, separating the peninsula from the mainland and creating the island we have today. On either side of the canal, the Army Core of Engineers, that maintains the waterway, has built wide paved access roads. Walkers, runners, roller bladders, and non-motorized vehicles enjoy this almost flat, scenic 8-mile path right next to the water. 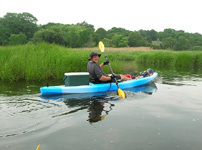 On the Cape side of the canal, it starts next to the Sandwich Marina and runs under both the Sagamore and Bourne Bridges to the Rail Road Bridge in Buzzards Bay. The easy ride gives you time to observe the water traffic, which ranges from small fishing and pleasure boats, to three-masted tall ships, to huge ocean tankers guided by Tugs heading to Boston. After a round trip ride of up to almost 20 miles, you can enjoy refreshments at the Aqua Grille as the sun sets over the marina. I often do the sunset, even if I do not make the ride. Comfortable bikes are available for rent from Justin at Ecotourz. 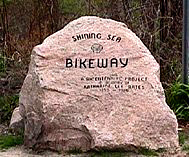 About 15 miles away in North Falmouth is the beginning of the Shinning Sea Bikeway that runs through Falmouth and Woods Hole. It was named for a line in the song America the Beautiful that was written by Katherine Lee Bates, a long time Falmouth resident. Like many of the paved bike trails today, this one started as an abandoned railway right-of-way and has been reclaimed, cleared and paved. Like the original rail lines, it meanders through the back woods, past small ponds and in this case along the beach on Vineyard Sound and past the Nobska Lighthouse. This mostly flat 10.7 miles path runs from County Road in North Falmouth to the Steamship Authorities’ parking lot in Woods Hole. Full service bike shops for rentals and repairs are conveniently located at the start and in Falmouth. 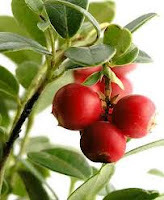 At trail’s end, treat yourself in Woods Hole at Jan’s favorite spot for key-lime pie, the Pie in the Sky coffee shop. 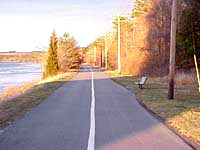 These are two of our favorite bikeways on the Upper Cape that we refer our guest to for easy, scenic cycling. 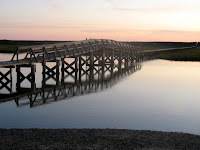 The Cape Cod Bike Guide web site has more information on each of these trails including downloadable trail maps, a complete list of bike shops, and directions to parking lots at the various access points on the trails. 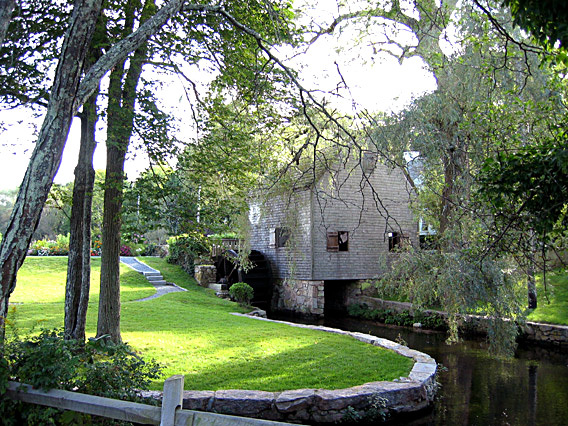 Stay with us at our Sandwich Inn and we’ll fill you in on the other fun things to do while you enjoy the trails. Lighthouse hunting is a favorite pastime for guests who stay at our Cape Cod bed and breakfast. Nantucket is a magical island like no other I have visited and it is home to three picturesque lighthouses; Brant Point Light, Sankaty Light, and Great Point Light. These beacons of safety have been guiding mariners into harbor for centuries. During the 1800s, Nantucket was a major whaling port. Many books have been written about this small island and it's whaling history. One of my favorite is Ahab's Wife written by Sena Jeter Naslund. This magical book weaves fascinating stories about whaling in and around Nantucket. The first light, and the second to be built in the colonies, Brant Point Light was built on the island of Nantucket in 1746. 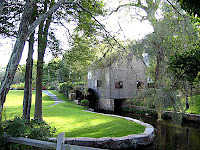 It was a wooden structure built on Nantucket Harbor. It was replaced several times over the years as it was destroyed by fire or storm. The first brick tower was built in 1856 and was lit on December 10th of that year and bore a Fourth order Fresnel lens that beamed a fixed light. Although this structure still stands, because of erosion a new tower was built in 1901. It was only 26 feet tall and was again constructed of wood. It was fitted with a Fifth order Fresnel lens. Some years later, the light would be changed to a flashing red so that it was more easily differentiated from the lights of the town. Brant Point Light is still guiding mariners today. Although its flashing red light is only 26 feet above sea level, it can be seen ten miles out to sea. When you visit Nantucket, it is one of the first things you see as the ferry rounds Brant Point and heads into the harbor. You can walk to the grounds on which it stands but the lighthouse itself is not open to the public. Built in 1850 of brick, Sankaty Light is located on Sankaty Head in Siasconset (known as Sconset to the locals) and stands 70 feet tall. The lighthouse was originally fitted with a Second order Fresnel lens, making it the first in the United States to have one of these lenses. The fixed white light that it emitted could be seen for 20 miles out to sea and was called by fishermen 'the blazing star'. Sankaty Light was electrified in 1933 and changed to a flashing light. In 1950, the Fresnel lens was replaced by a modern rotating beacon and in 1965, the light was automated. The original Fresnel Lens is now on exhibit at the Nantucket Whaling Museum located at 13 Broad Street near where the ferry docks . The museum is a must see when visiting Nantucket. Some guided tours of Nantucket Island include the lighthouse but the tower is not open to the public. If you decide to go it on your own, leave Nantucket Village by Milestone Road and head out to Siasconset. 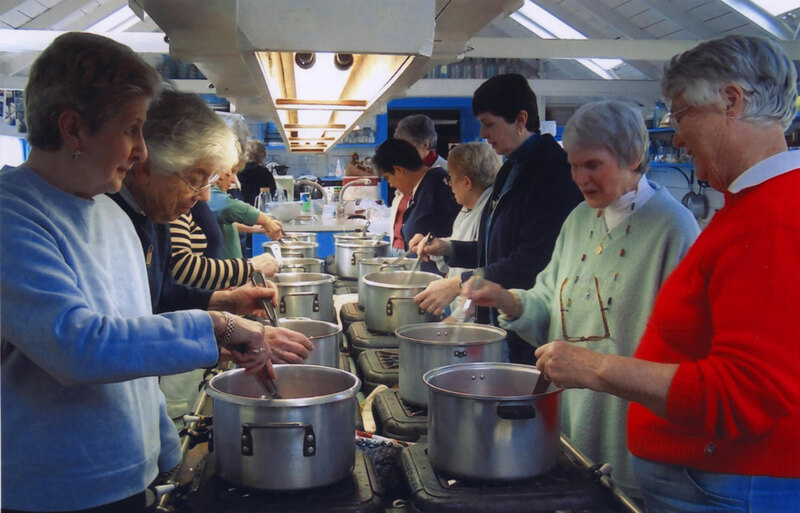 When you reach the rotary, take Sankaty Avenue to Butterfly Lane and turn right. When you reach Baxter Street, turn left. At the end of Baxter, you will see where the original light was and the new one 400 feet from the original site. During the 18th century, the area between the mainland and Nantucket was one of the busiest shipping routes and one of the most treacherous. Residents of the island requested the building of a lighthouse to reduce the number of shipwrecks in that area. In 1785 the first lighthouse was constructed on what was then called Sandy Point and was made of wood. It was destroyed by fire in 1816 after which a 60-foot stone tower was built and finished in 1818. In 1857 a third order Fresnel lens was installed and in the 1950's, the light was automated. As erosion began to threaten the lighthouse, Islanders appealed to the Coast Guard to move it inland. The request was rejected and in 1984, the lighthouse was destroyed. Because of he efforts of Senator Edward M. Kennedy, federal money was made available to build a replica of the original light some 300 yards from the old site. It is made of concrete and plastic and stands 60 feet high. A solar powered white light flashes every five seconds. You can reach Great Point from Nantucket Village by traveling east to Polpis Road and then turning north on Wauwined Road. You will need a four-wheel drive vehicle and a permit to travel the seven miles from Wauwinet to the lighthouse. The area where Great Point light is located is not open to the public as it is a nesting area for the endangered piping plover. From May to October guided tours of area are available through the Coskata-Coatue Wildlife Refuge. The tour includes a climb to the top of the tower. The Fresnel lens is fittingly on display in an area outside the Nantucket Lifesaving Museum which is located at 158 Polpis Road. The lighthouses are not the only attraction to Nantucket but a visit there isn't complete until you have paid homage to these historic beacons of safe harbor.